About the series: Whether it is the existence of aliens, the possibility of life after death, or sightings of strange creatures, the lure of the unknown has always been irresistible. Now, using the latest scientific techniques, this series seeks to ascertain whether these strange occurrences, myths and startling phenomena are merely illusions or actually real. 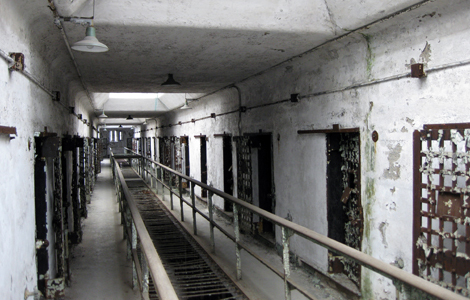 Eastern State Penitentiary, a huge forboding fortress which was built to lock away the worst offenders in society. A study in isolation, which depressed inmates and drove them mad. ESP closed in 1971, and since then many report hearing a range of strange sounds from weeping to tormented screams. People have reported seeing shadowy shapes darting throughout the prison. What is different about this ghost busting show, is that National Geographic brings in a team of engineers from different scientific areas of expertise to seek out the ghosts of Eastern State. They set up the usual ghost hunting equipment; motion sensors, night vision and infrared cameras,3D laser scanners and accoustic triangulation systems. These scientists are trying to find out what ghosts are made of and if indeed Eastern State is haunted. I thought one of the most interesting pieces of this programme is when they used the 3D laser scanners to recreate the prision to determine if there was ghostly activity or physical activity. The team uses scientific principles to explain the noises and other eerie activity in the prison. Some things cannot be explained away by science. Don’t miss this one if you are a fan of Most Haunted.